And zero for actual performances. That's an average day for a failed musician. John F wrote: And zero for actual performances. That's an average day for a failed musician. I think it means average day when a performance is not scheduled, though when you think about it, what percentage of a full-time performing musician's time is actually spent in delivering the final product? I am inclined to take the pie chart a bit more seriously, to the extent that it was intended seriously at all, because I have seen it on Facebook posted or approved of s by more than one serious professional performing musician. 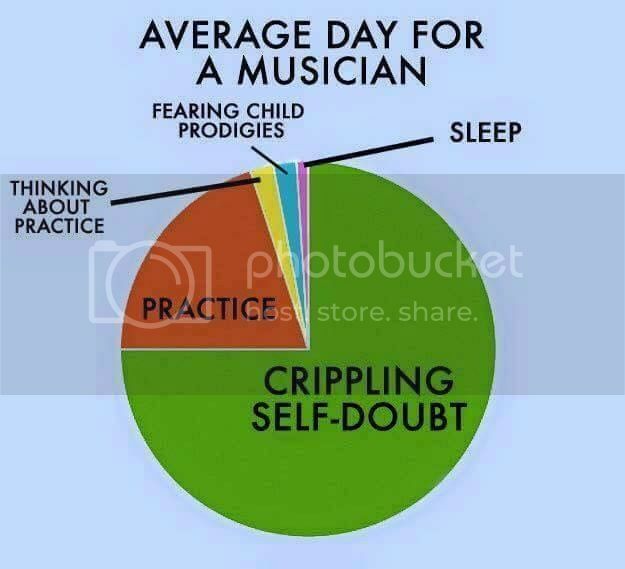 Also, I feel sufficiently versed in the matter to state that the portion devoted to "crippling self-doubt" is scarcely an exaggeration, and is enhanced by "fear of child prodigies." No, really. I think it means average day when a performance is not scheduled, though when you think about it, what percentage of a full-time performing musician's time is actually spent in delivering the final product? You're taking it too seriously. The pie chart is a joke and is meant to be. But for what it's worth, an average day for a musician in the Metropolitan Opera Orchestra (during the season, of course) involves 3 to 6 hours of paid rehearsal time and, depending on the schedule, 3 to 5 hours of performance. How much more time does the musician spend practicing? That depends, of course. I would guess very little except when learning a new and difficult work. The Met's orchestral players and choristers have multi-year contracts, so self-doubt isn't likely to weigh heavily on them, and child prodigies need not apply. Oh, you're still developing repertory? I would have thought from your previous posting that there were no mountains left for you to climb. Your assessment of the situation up to this point, but not after, actually resembles that of John F, and I am sure you are as delighted as he to be mentioned in the same sentence. It is based on the assumption that the pie chart was intended to apply to a working staff musician, however virtuosic, while I was assuming (without insisting on it) that it was based on the experience of the serious concert soloist who is mainly concerned with his or her next exposed polished performance before an audience. I know John F and he's no auntie Lynn! 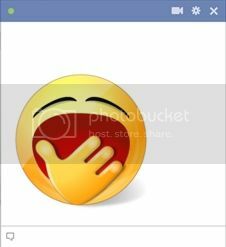 It is not terribly difficult to figure out who Lynn is based on information she has provided in her previous posts over many years and a Google search. I have never doubted her claims regarding her own level of accomplishment, no matter how extravagant they have sometimes been. There's plenty of extreme but uncelebrated talent in the world. What I don't understand is why she needs the added gratification of insulting others. If we're that beneath her good opinion, why does she bother to come here at all? She is not the only accomplished musician I have come across who is fond of saying how wonderful she (or he) is because it is not enough to let those whose opinion matters recognize it on their own, but she is the only one who goes this offensive step further. give you something to do...at last. But don't you see that with that statement you are finally revealing a chink in the armor? The self-proclaimed most accomplished pianist in all of San Francisco doesn't look for new repertory appropriate to her abilities on IMSLP unless she is in some way compromised. (Note: It is OK for professional musicians to be compromised. There are few who are not.) IMSLP is where I go to find the secondary Baroque stuff I play on Sunday morning, but I don't pretend to be anything other than a perhaps over-educated simple country organist. It is beyond me what gratification you get out of coming here, where people only want to exchange thoughts on their appreciation of classical music and the mood in recent years has been magnanimous. I haven't even visited the thread in the Pub on Donald Trump to which you have contributed. I blanch to think what you might be dishing out over there that others less exposed to the history of this board than myself might still be taking seriously. I don't mind Auntie Lynn 's insults. I find them entertaining, just as I do her egotism. You just have to see it as theatre, Lenny. I certainly don't like seeing anyone thrown off the board. barney wrote: You just have to see it as theatre, Lenny. information, ever. It goes with the territory. have no time for autograph seekers or stage-door johnny’s. Sorry to say this, but working musicians (as opposed to leading soloists) can be nasty, egotistical and bombastic just like regular folks: it comes with the territory. It's why conductors are known to be domineering rather than friendly and open. Friendly and open simply doesn't work in the orchestra pit: it mostly results in blah music-making. Leonard Bernstein made great music happen in New York, but he had to raise his voice to do it, and demand extra rehearsals to boot. While the players admired him, there were many who were angry & complained. Auntie Lynn's just letting off steam: she needs to feel superior to someone, which leads me to believe she's working in a typical negative atmosphere where she's put down on a regular basis: this is just how she relates to people. It's sad, really. And, no, the insults really don't belong here, not at all. I have nothing more to say on the subject, except that the Chatterbox is sacred ground, and should be respected. maestrob wrote: Sorry to say this, but working musicians (as opposed to leading soloists) can be nasty, egotistical and bombastic just like regular folks: it comes with the territory. It's why conductors are known to be domineering rather than friendly and open. Friendly and open simply doesn't work in the orchestra pit: it mostly results in blah music-making. Leonard Bernstein made great music happen in New York, but he had to raise his voice to do it, and demand extra rehearsals to boot. While the players admired him, there were many who were angry & complained. OK, B., which of those not mutually compatible statements (in this context) is your real opinion? All of them are true. I stand by the one that says the Chatterbox is sacred ground, and that while AL may be just letting off steam, the steam belongs elsewhere, not here. maestrob wrote: All of them are true. I stand by the one that says the Chatterbox is sacred ground, and that while AL may be just letting off steam, the steam belongs elsewhere, not here. Speaking from my own experience as a performing musician before a physical disability force me to retire, I certainly never spent any of my time worrying about child prodigies ! I was something of one myself as a horn player starting from age 9 . I didn't have "crippling self-doubt" , just a lot of frustration from numerous setbacks and rejections, which are par for the course . I did spend a lot of time both practicing and at rehearsals .